Row by Row begins Wednesday, June 21st! Remember to Buckle Up! before you go! Stop by the Blue Hen and pick up your free pattern or maybe you would prefer a kit- just $13.95 each. What is Row by Row? 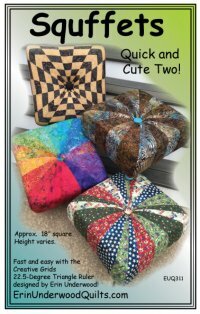 Beginning June 21, 2017, visit any of the participating shops and receive a free pattern for a row in a quilt. Combine your rows in any way to create a unique quilt that represents the fun you had traveling to the stores. Travel with friends, discover new quilt shops and have fun collecting rows! Create a quilt using at least eight different 2017 rows from eight different 2017 participating Row x Row shops and be the first to bring it into a participating shop to win a stack of 25 fat quarters (6-1/4 yards of fabric!). 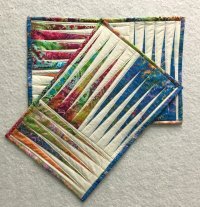 Use that shop’s row in your quilt and win a bonus prize! And in case you have some free time on your hands and would like to try something new - here's some of our upcoming classes. 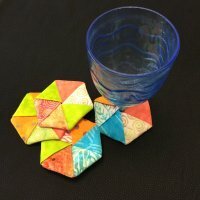 Basic paper piecing makes these points so perfect! Square Tuffets! Get them done in a day!